*Disclosure: I received free product in return for this post. Kidecals are a great option. Dishwasher, washing machine and dryer safe, they are perfect for almost any surface. Eventually marker fades or washes away. They are durable and can stick to almost any surface. Pool toys being one that I have yet to find another label that will stay. 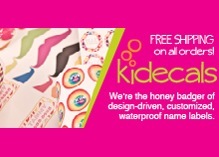 In addition to their personalized name stickers, they also have fun mustache stickers for labeling drinks, and mustache chalkboard stickers for labeling toys or other supplies. I would use them to label food and drinks at a party, or just for fun. Lego containers are in dire need of some new labels around here. If mustaches aren’t your thing, they have extra styles of chalkboard labels to choose from and to make it even better they are dishwasher safe! What fun labels! I love that they are dishwasher, washing machine and dryer safe!